Best laminate flooring brand: how to choose quality laminate flooring? 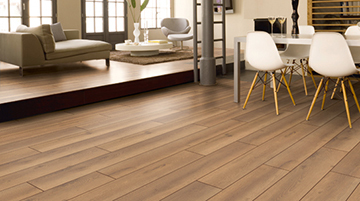 Best laminate flooring brands are the ones that make good quality flooring at reasonable prices. The balance between quality and price has always been a tricky thing, which is why it is important to find the best laminate flooring brand that focuses on building a strong and lasting relationship with its customers. We at Floor Experts realize that it is good quality products, expert knowledge, good customer service and reasonable prices that sells flooring, which is why we try to represent the best laminate flooring brands and have the best laminate flooring prices for our customers. Where to find the best laminate flooring brands? Floor experts is one of the top flooring suppliers in Eastern Europe, distributing laminate flooring from the best laminate flooring brands, like Cosmofloritan, Krono Original, ELFC Egger, Swiss floors, Villeroy & Boch, Aqua-step and so on. We realize that the best laminate flooring brand has to have a wide range of choices, good quality flooring and competing prices, which is why we choose our partners very carefully. We understand our customers’ needs and care for their satisfaction, which is why we only represent products from the best laminate flooring brands and try to offer the best laminate flooring prices on the current market. What type and brand of laminate should I choose? Choosing the right type of laminate, however, isn’t just about choosing the best laminate flooring brand in general. It means choosing the right brand for your specific needs, depending on weather you're choosing the best laminate flooring for bathrooms or kitchens, best laminate flooring for dogs and kids, or the best laminate for an office space. Knowing what your needs are, is very important when choosing a brand. For example, Aqua-step, 100 % waterproof laminate flooring is the best laminate flooring for bathrooms, whereas if you’re looking for the best laminate flooring for dogs and children, water resistance isn’t as important as impact resistance and ease of cleaning, so Krono Original or Life Style can be the best laminate flooring brand for you. At Floor Experts, we will gladly help you choose the best laminate flooring brand for your specific needs and wishes, as well as advise you on the best underlay for laminate flooring and even recommend an expert to install your floors. Anything we can do to help you make the best choice that you will be happy with for years to come.